Publius Pundit carries an excellent post on takeover of Russia by current and former members of the KGB. Not even in Soviet days did the Russian security services enjoy the power they do today. Check out to full post here. It is well worthwhile. Analyst Pavel Simonov traces the KGB’s return to power in Russia back to 1998, when “a former non-staff assistant of Andropov, the ex-head of Foreign Intelligence, Evgeny Primakov, headed the government. The following spring the former chief of FSB (main successor of the KGB), Sergey Stepashin, replaced him. Under Putin, the transition to KGB rule has proceeded with alarming speed, so that today “one study has concluded that 78% of leading political figures, heads of departments of the Presidential administration, all members of the government and members of both chambers of parliament, heads of federal structures and heads of executive power and legislature in regions, somehow in their career have been connected with the KGB or the organizations that had come to replace it.” A stunning 26% of the group actually admits openly to prior KGB service. Reform of the KGB never really happened. The organization was broken into several agencies in the early 1990s, but the reforms were abandoned,especially after [Vladimir] Putin became president. The KGB’s capacity to be a political organization is back. And unlike the Soviet era, the secret services are now in full power. [Putin] was a lieutenant colonel in the FSB [the KGB’s successor agency] and all his major associates and deputies in the Kremlin are former KGB employees. Major Russian monopolies such as Gazprom and the railroad monopoly are controlled by former KGB agents. Overall, some 6,000 former or current intelligence officers are in the executive [branch] and legislature. Shortly after his election as Russian President in 2000, Vladimir Putin was driven to the headquarters of the former KGB in central Moscow to celebrate the anniversary of the founding of the Soviet secret police. The former KGB colonel, a Soviet-era spy in East Germany who later reached the pinnacle of the security services by becoming the first civilian director of the KGB’s domestic successor organisation, the FSB, was returning to his spiritual home. Inside the Lubyanka, the new Kremlin leader addressed 300 of the former KGB’s finest. “Instruction number one of the attaining of full power has been completed,” he dead-panned. 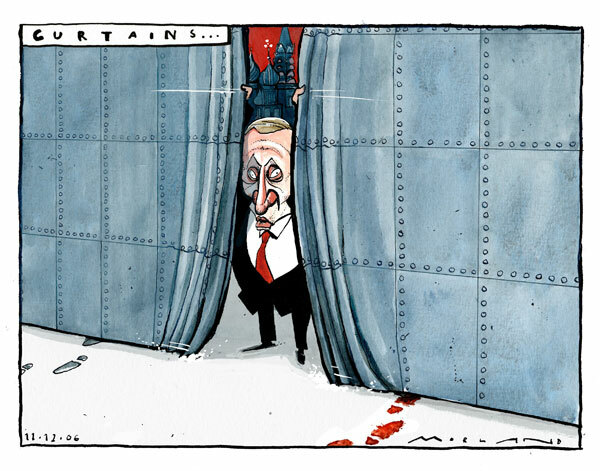 Six years on, Mr Putin’s joke looks more like a statement of fact. The poisoning of the ex-FSB agent Alexander Litvinenko in London, which according to at least one Russian commentator has cast relations with the West back to the days of the Cold War, has placed Mr Putin’s links to his former FSB colleagues under fresh scrutiny. No surprise there. Russia's FSB has always intergrated its old Cold War KGB types into the mix. Putin being one of the examples. Though few Americans have paid attention to what has transpired in Russia since the Reagan-era breakup of the USSR, they should have. President Vladimir Putin has been chiseling away at the foundations of democracy in the former Soviet republic -- limiting free speech among individuals and the news media and silencing critics of his administration through the use of bully tactics. Should we be surprised by the actions of a former head of the infamous KGB? Not at all. Let the world know you support those people fighting to see Democracy and freedom rule in Russia with one of the items from this online shop: www.cafepress.com/bobmccarty/2269968.